The feds have promised lodging at traditional fish camps -- but haven't delivered. Paul Lumley, like many Yakama Nation citizens, grew up fishing on the Columbia River, through which salmon flowed like blood. Though Lumley's family lived north of the Columbia, in Washington's Yakima Valley, his family migrated to the river each fall to set gillnets for valuable chinook. Lumley slept in the truck bed for months at a time, steeped in eau de salmon, at Underwood, a small, decrepit fishing camp set aside for American Indian use by the federal government. "It was really rough living," Lumley recalls. Today, 31 such fishing camps line the river, and hundreds of tribal members flock to them during fishing season. Up to 160 families also inhabit the camps year-round. Lumley now serves as director of the Columbia River Inter-Tribal Fish Commission, a tribal management agency that conducts fisheries research, enforces regulations, and operates hatcheries. Despite its fishy focus, Lumley's agency is also worried about the Columbia's camps -- among the quietest housing crises in modern-day Indian Country. The housing dilemma, like many Northwest tribal fisheries conflicts, has its origins in 1855, when treaties pushed tribes onto reservations far from the Columbia. Though the treaties guaranteed American Indians access to traditional fishing sites, the reservations were anathema to those whose sustenance and culture flowed from the Columbia's waters. White soldiers fought them and settlers murdered them, yet some tribal members remained rooted to the riverbanks, growing gradually distant from their reservation kin. According to the historian Andrew Fisher, "River Indians" today "constitute a shadow tribe, part of and yet separate from the tribal bodies whose fortunes they share." Although the housing crunch has simmered for decades, in the last several years it has erupted into a full-blown crisis. Record-setting salmon runs have lured more fishermen from the reservation to the river, crowding the sites in summer and fall and straining their deplorable infrastructure. In turn, the tribes have recruited congressional allies to make their case to the Corps, which has acknowledged its responsibility to build new housing. But bureaucracies move slowly, and dispensing reparations for historical injustices has never been America's strong suit. Says Yakama fisherman Randy Settler: "It's not a popular issue to build replacement homes for something that happened 70 years ago." Poor living conditions are common in Indian Country -- more than 5 percent of homes on Native American land lack plumbing, 10 times the national average. Still, Lone Pine, Oregon, a tribal fishing camp 85 miles east of Portland, is a particularly run-down aggregation of trailers and shacks sided with corrugated tin and tree bark. Hubcaps and piles of clothes litter the packed-dirt track; derelict vans and motorboats perch on cinderblocks. A single bathroom serves the 40 permanent residents, whose numbers swell during fishing season. Drug abuse, including meth and heroin, is rampant. Lone Pine sits on basalt bluffs across the river from the The Dalles Dam, which generates power for a nearby $1.2 billiion Google data center, among other infrastructure. "How do you think people at Lone Pine feel looking at this huge dam every day, making all those other people rich?" says Lumley, a rangy, cordial man whose voice grows softer the angrier he gets. "When I ask this community if they want a free house, they look at me like I'm crazy. They want water that works." The substandard facilities aren't merely eyesores, they're also hazardous to health and safety -- as demonstrated by Lumley's uncle, a wizened, good-humored 86-year-old named Johnny Jackson. Jackson, a chief of the Cascade Tribe, one of the groups that comprise the Yakama Nation, has lived at the Underwood site since the 1960s, when he resisted the Corps' attempts to oust him and turn the landing over to white sport fishermen. "My sisters used to come and help me have a salmon-bake right here," he recalls, standing in the shade of a fish-cleaning station. In September 2014, Jackson's hand-built house caught fire when a faulty fuel line caused his propane tanks to hurtle through the air like bottle rockets. When firefighters arrived, they found that the nearby yellow fire hydrant wasn't connected to any water source. Jackson's home was reduced to charcoal. Now he lives in a trailer. Lone Pine and Underwood are not unique in their dilapidation -- the bathroom in a 3-acre site called Cooks Landing doesn't even have a door, and most of the other 31 sites suffer from similar conditions. But even supplying these spartan services is draining the Crops' coffers: According to Laurie Jordan, a policy analyst for the Inter-Tribal Fish Commission, it costs more than $40,000 per year just to pump the septic tank at Cooks Landing. The abysmal quarters contrast painfully with nearby North Bonneville. When that town had to be moved in the 1970s to make way for a new dam powerhouse, its mostly white residents secured $35 million for relocation. today, the community is a Pleasantville-esque complex of churches, tennis courts and ball fields. "I'm happy for them," says Lumley as we drive through the hamlet. "But we have people who are owed basic amenities." After more than 70n years of neglect, new housing may finally be on the horizon. In 2013, a Corps-commissioned report acknowledged that many displace families had never received relocation assistance, and that the facilities were inadequate. The 2016 iteration of the Water Resources Development Act, biennial legislation that authorizes Corps water projects, includes language about granting relocation assistance to displaced families. In July, congressional delegations from Oregon and Washington also introduced legislation in the House and Senate that would direct the Bureau of Indian Affairs, which owns the sites, to improve sanitation and electrical infrastructure. "These are items that shouldn't wait for longer-term legislative action," says Rep. Earl Bluemenauer, D-Ore., one of the bill's authors. "It's extraordinarily frustrating that we've allowed these conditions to persist." Although passing the legislation will be a tall order in an election year, the housing momentum is gathering. If and when funding arrives, the tribes will face a difficult decision: Who will build and manage the infrastructure? though the Bureau of Indian Affairs was once responsible for operations, maintenance and law enforcement at the sites, everyone agrees the agency bungled the job -- a posted emergency phone number, for instance, sometimes routed calls to an office in Wyoming. These days, those responsibilities are handled the the Inter-Tribal Fish Commission, but it's an awkward fit. "Fish is our middle name," says Lumley. "Housing isn't." Lumley hopes the tribes will create a housing authority to steward the long-term economic development that these people need," he says. "But it needs to come directly from the communities themselves." More than 150 years after the U.S. Army attempted to dislodge the Columbia River Indians, the river tribes remain in the shadows. Many year-round river dwellers, says Jordan, don't avail themselves of service like welfare, food benefits and energy assistance, which are widely used by reservation residents. 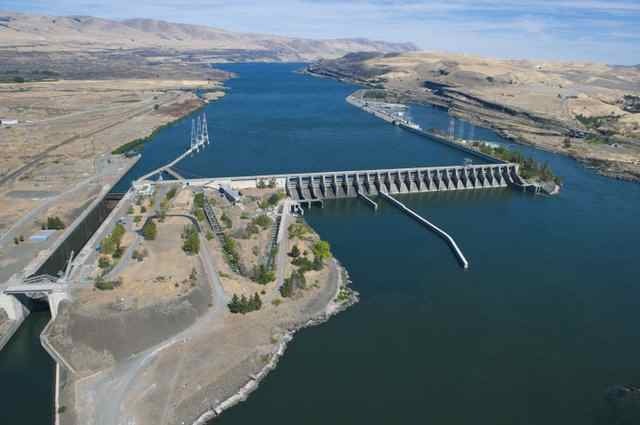 According to Wilbur Slockish, a bearish 71-year-old Klickitat chief, off-reservation Indians remain out of sight and out of mind when the salmon aren't running. "The tribe's mentality is the reservation, and it's always been that way," he says. "We're on our own." Few river dwellers know that better than David Sohappy Jr., a Yakama fish technician whom I meet on a warm sickle-moon evening at Drano Lake -- a Columbia River pool formed when Bonneville Dam inundated a historic fishing village in the 1930s. In 1982, when hostilities between the River Indians and the government were near their apex, Sohappy and his father were arrested at Cooks Landing for illegally selling fish to undercover federal agents. Though they pled entrapment, both men received five-year sentences. "I remember him lying awake on his bunk in prison, banging his fist agains the wall," Sohappy says. That Sohappy, once jailed as a poacher, now works as a tribal fisheries manager is a sign of how far the Northwest has come. Salmon runs, though still just a vestige of their pre-dam glory, are stronger than they've been in decades, and fishing has has reassumed its prominence in Native life. Fifty years ago, when many runs stood on extinction's doorstep and officers tear-gassed Yakama fishermen for "trespassing," it would have been almost impossible to imagine the Columbia River teeming with Native-owned boats. Some injustices, however, can never be rectified. So happy's own great-grandmother grew up alongside the Columbia, but was forced to move away when her village was drowned by Drano Lake. "She wanted to live near the river," Sohappy says. "She died waiting for the house the government promised her they'd build."